Thousands of people have greeted Iranian Nobel Peace Prize winner Shirin Ebadi in extraordinary scenes at Tehran's city airport on her return to the Iranian capital. Human rights groups and non-governmental organisations, swelled by crowds of local people, gathered at the city airport to give her a hero's welcome. The human rights activist, who has already used her elevated profile to urge the Iranian Government to allow greater freedom of speech, called for political prisoners to be released as she stepped off the plane. Iran's President Mohammad Khatami has urged Mrs Ebadi, the country's first Nobel Peace Prize winner, to use her award for the good of Iran and world peace. He has also played down the significance of the award, saying it was "not very important" and was awarded on the basis of "totally political criteria". Noted for promoting the rights of women and children by seeking changes in Iran's divorce and inheritance laws, she is the first Muslim woman to be awarded the Nobel Peace Prize. The area surrounding Tehran's Mehrabad airport was brought to a standstill by traffic jams. Many people simply abandoned their cars and walked the rest of the way, singing pre-revolutionary Iranian nationalist songs and chanting slogans calling for the release of political prisoners. 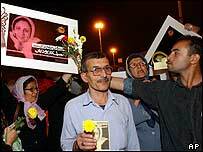 However, the crowd gave a hostile reception to a number of reformist deputies who turned up to welcome Mrs Ebadi. They said the deputies had betrayed the hopes of those who had elected them. Mrs Ebadi, 56, was said to be visibly emotional as she returned from a short trip to France, where she heard news of her award on Friday. It really was an extraordinary occasion, probably far beyond what the organisers had imagined would happen, says the BBC's Tehran correspondent Jim Muir. Many of her supporters at the airport, including a large number of women, wore white shirts or headscarves as a symbol of hope for peaceful change in the country. Many of them were carrying white flowers too, symbolising their welcome for Shirin Ebadi. 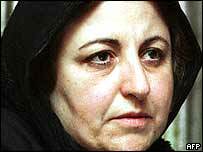 "I hope that all political prisoners will be freed," said Mrs Ebadi. "This prize is not only for me, but for all those in favour of peace, democracy, human rights and legality. The world recognises the fight of Muslim women, and this is my political message." The reception committee is believed to have included a number of internationally-known film directors and the popular captain of the country's national football team. Hundreds of Mrs Ebadi's supporters, including the president of France's biggest human rights group, had gathered at Orly airport in Paris to bid her farewell. Before her departure, she told the BBC that the Nobel prize had given her a new determination to defend the rights of women and children in her homeland. BBC correspondent Sadeq Saba in Paris said Iranians throughout the world were celebrating this first prestigious award for their country. 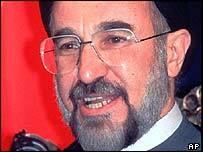 Our correspondent says the Iranian Government appears to be confused about how to deal with Mrs Ebadi. The reformists have welcomed her achievements, but hardliners have condemned the award as an attempt by the West to weaken the Islamic government and promote secularism in Iran, he said. "The mood was one of jubilation"